Perrin Motor Mounts - Excelerate Performance - European, Exotic and Japanese Performance Specialists!! PERRIN Performance engine mount kits reduce drivetrain movement under hard acceleration, deceleration and corning. Allowing the most efficient transmission of all available power to the ground. This means easier transitions from on and off throttle power in daily driving, more accurate launches during drag racing and auto cross type events where you do not want drivetrain slop. PERRIN engine mount kits also improve reliability, as they can not tear apart over time and with abuse like OEM or Group N mounts which lead to other drivetrain related failures. The PERRIN Performance engine mount kit featuring Energy Suspension mounts with a patented Interlock design. Unlike OEM and Group N mounts, the unique shape of Energy Suspension’s steel internals keep the mount from physically tearing apart. Small oil leaks, or highly corrosive atmospheric conditions combined with extreme temperature changes will make OEM and Group N rubber mounts brittle and lead to failure. The PERRIN Performance engine mount kit with Energy Suspension mounts features 75A durometer polyurethane that is impervious to oils and other chemicals, easily outlasting the OEM mounts. The PERRIN engine mount kit includes upper engine mounts and lower mounting brackets with heat shields. Most replacement mounts reuse the heavy OEM steel bracket, but PERRIN mounts are CNC’ed 6061-T6 aluminum brackets, making a stronger mounting surface for the stiff urethane mounts. The PERRIN engine mount kit is ideal for those with OEM plastic type mounts as you will not need to buy additional parts to replace faulty or cracked plastic brackets. OEM and aftermarket mounts use a stud and nut to secure the engine to the chassis. Making removing and installing the engine into the car somewhat tricky. 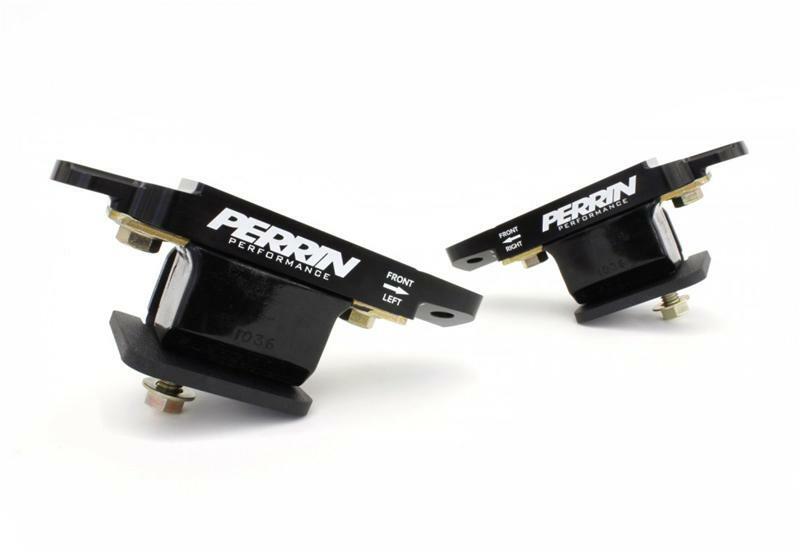 The PERRIN Mounts use a bolt in place of the stud which means you do not have to lift the engine up past the studs, or get the mounts perfectly aligned to the transmission and subframe when installing the engine. This small detail was done specifically for the customer who is constantly pulling the engine out to add new part, rebuild, change clutch or any other big engine upgrade. Another PERRIN advantage! This part installation is for the advanced DIY’er. Without specialized equipment in your home garage, we recommend having a professional shop perform the install. Please note the 5 wrench installation rating and please download and read the instructions before deciding to install these mounts yourself.